4D Sports Tennis is a revolutionary tennis game that unfortunately was both critically and commercially less successful than its over-hyped cousin 4D Sports Boxing. Based on a more advanced version of the polygonal 3D engine used in 4D Sports Boxing, 4D Sports Tennis features more detailed and realistic player movements, a complete career mode, and enough gameplay options to satisfy tennis fans for months on end. Although the game's hallmark is the smooth 3D graphics that make the players' movements very convincing, 4D Sports Tennis also includes many options that qualify it as a sport simulation rather than a simple action game of tennis. You can create a player from scratch with detailed RPG-style statistics, such as allocating points for his or her maximum speed, acceleration, and endurance. These statistics will gradually increase with training and experience on the court. You can also change your player's looks, height, weight, and handedness -- all of which are reflected appropriately (increase the weight, for example, and you will see your player become more chubby). You can play in practice mode, an exhibition game, join a tournament, or -- best of all -- design a complete 5-year career for yourself by selecting what you would like to do in each month of every year (e.g. practice, compete in the Italian Open, etc.). On the court, you will be amazed by the players' life-like movements and realistic ball physics. Players even lower and sway their knees in anticipation of the opponent's serve-- much like their real-life counterparts. The mouse-based interface takes some getting used to, but will prove very intuitive: mouse buttons control the racket, and moving the mouse controls your movement. If you dislike playing from the first-person perspective, you can hit ESC to bring up the Options menu, and change to a behind-the-player camera view. You can even adjust the camera's position and angle to your liking, as well as save any replays of your favorite shots to watch later. During the game, you can view each player's profiles, and browse various statistics that are automatically recorded, such as the number of aces, backhand winners, % of points won on first serve, and so on. You also must keep track of your energy level, since exerting too many volleys and fast balls can eventually make you too tired to run for the ball. 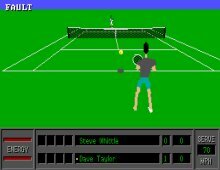 Overall, 4D Sports Tennis remains today one of the best tennis games ever made. The lack of doubles mode and audience are just about the only two things that are missing from the game. If you're looking for a realistic, highly playable tennis game that is very challenging, look no further. Two thumbs up! If you like the game, check out Compaq Grand Slam Cup and World Tour Tennis, two subsequent titles based on the same engine.